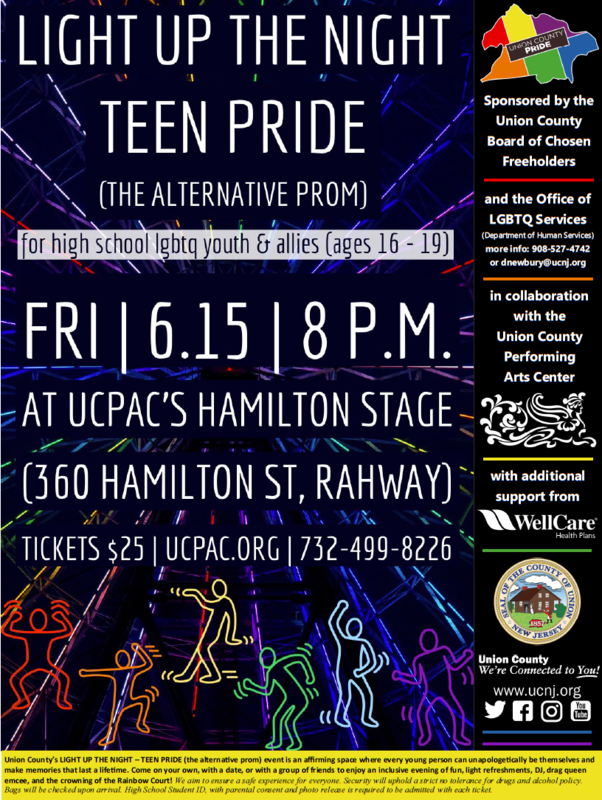 The Union County Board of Chosen Freeholders and the Office of LGBTQ Services, in collaboration with the Union County Performing Arts Center and with support from WellCare Health Plans, is proud to host the first Union County LIGHT UP THE NIGHT – TEEN PRIDE (the alternative prom) event for LGBTQ and ally high school youth (ages 16-19) on Friday, June 15 from 8:00 p.m. – 11 p.m. (doors open at 7:30 p.m.) at UCPAC’s Hamilton Stage located at 360 Hamilton Street, Rahway. Tickets are $25 each and are available online at ucpac.org. Light up the Night – wear neon or white to shine all night, glam it up, or come as you are. Union County’s LIGHT UP THE NIGHT – TEEN PRIDE (the alternative prom) event is an affirming space where every young person can unapologetically be themselves and make memories that last a lifetime. Come on your own, with a date, or with a group of friends to enjoy an inclusive evening of fun, light refreshments, DJ, drag queen emcee, and the crowning of the Rainbow Court! We aim to ensure a safe experience for everyone. Security will uphold a strict no tolerance for drugs and alcohol policy. Bags will be checked upon arrival. High School Student ID, with parental consent and photo release is required to be admitted with each ticket. This year’s Union County PRIDE events are organized by the Union County Office of LGBTQ Services. Established as part of Chairman Granados’ 2018 Moving Union County Forward initiatives, the Office of LGBTQ Services, under the Division of Outreach and Advocacy in the Department of Human Services, is the first County government office of its kind in the State of New Jersey. It provides a platform for leadership and collaboration to support equality, serving as a catalyst for advocacy, awareness and action.